I sewed these up last night, they are so ugly they are good. I drafted up my own little pattern and whipped them up in no time. I must admit I haven't lined them but I am dreading handsewing in the lining. I made them to consign at a shop downtown. I used vintage pillowcases and tablecloths! They close with a matching zipper. I'm really pleased with them! TUTORIAL FOR MINIATURE DUFFLE BAGS! SEAM ALLOWANCE IS INCLUDED IN SIZE OF PATTERN. SEAM ALLOWANCE IS 5/8" FOR ALL PIECES. Cut out 1 piece of outer fabric 20 1/2 inches by 13 1/2 inches. Cut one of interfacing also. Cut out 2 pieces of outer fabric in a circular shape 7 1/2 inches in diameter. Cut two of interfacing. Fuse your interfacing to the wrong side of the fabric now. Fold the fabric in half (right sides together), matching shorter sides together. MACHINE BASTE (with a large stitch) along the top of the bag (this is the side that measures 13 1/2"). You will now have a sort of hollow log. STAY STITCH around the circular edges 4/8" from the edge. Be sure to separate the top seam so you sew over the seam allowance. Press down the seam allowance from the top seam. Now its time to sew on the zipper. Place the zipper over the fold you just press down, the right side of the zipper facing down. If you are less experience with sewing I would suggest hand basting the zipper in place before you sew it down. If you feel confident, just pin it! Switch to your zipper foot, and sew along the zipper tape, making sure to keep a straight line, and the same distance away from the teeth the whole time. You want to sew only through one layer of fabric, and you will see this on the right side. Turn the bag so the right side is facing out. Carefully stitch pick the top seam which you machine basted to expose the zipper. (Remove any hand basting you have done at this point.) Remove any excess threads sticking around. Now its time to make the straps. You can choose to make them any size you want, as long as you are sure they will wrap around the full width of the bag. These straps are around 40" long total. They let the bag fit very nicely under your arm. 1: cut two long strips at least 41 inches long and 3 inches wide of outer fabric, or a nice contrasting fabric. 2: cut two long stips the same size as above pieces of interfacing. 3: fuse interfacing to straps. 4: at the iron, fold each edge 1/2 inch inward so there will be no raw edges showing. the iron full length in half for a nice finished look. 5: with each long strip of folder fabric, put right sides together and sew them together. this will create a nice seam on the outside, and attach the two pieces together. 6: do the same with the other end of the straps, making sure not to twist them in the process. Now you should have a big circle of straps. Fold the bag in half, with the zipper at the very top. Place the straps on the bag, putting the two parts with the seam where you attached the strap together at the bottom. NOTE: Pull threads to back, and tie them to reinforce, even if you have backstitched. I sort of forgot to take pictures of this step, so hopefully this will be OK.
Sew this together with a 5/8" seam allowance. (you should not be able to see the stay stitching when the bag is turned right sides out.) Clip the edges close to the seam. 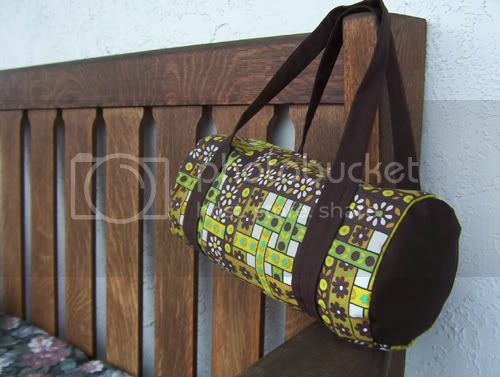 Turn the outer bag so the wrong side is facing you and the straps and right side of fabric is inside. Hand stitch the lining to the zipper tape. Be careful not to sew through to the good side of the bag, and use a matching thread to conseal any stitching on the inside. Turn bag right sides out and you are finished!! If you decide to try this, take your time and don't let yourself get frustrated, because it can be difficult! Good luck! wow! do you think you could post a tutorial? edit: thanks for the tutorial, i'll be sure to make one and post it when its done. How much will you be offering them for if you dont mind the asking? Those are adorable!! They turned out great, I love your choice of fabrics! You know what, I have no idea yet. I haven't quite figured it out, and I'm not sure how I would figure it out for consignment. Like, if its any diffent, do I lower the price? Raise it? I'm not sure. Thanks everyone, I'll try to make a tutorial in a while! I'm a llama! No wait...Sama! Oh I love them. Good job. The first one looks marvelous...how many times can i say it? I love this site and everyone who uses it, can't wait for the tute! I'm a guinea pig! Wheek! Hahah Those are so cute! I can't wait for your "tute"! those look really great! i specially like the first one. please post a tutorial soon!